Considered one of the finest cigar lines H. Upmann produces, the 1844 Reserve hand-rolled premium cigar continue to stand out as a top seller. This handmade cigar is produced in the Dominican Republic with an aged blend of Dominican fillers. The Nicaraguan binders add a bit of spiciness to the taste with an elegant Ecuadorian Cubano wrapper that brings all these great features together for a delightful and satisfying smoke. 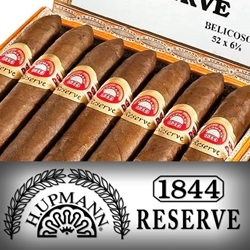 Smokers Discounts believe you'll love the H. Upmann 1844 Reserve premium cigars. We’ve made it easy and affordable to buy these premium cigars online. A variety of sizes and flavors are listed below. Each of these styles are available today for a discount price. Call us for more details!